The Cologne Boxing World Cup is one of the most difficult international competitions in the European continent which has started in Germany today. China, India, Mongolia and Thailand sent teams from the Asian National Federations to the Cologne Boxing World Cup in spite of the fact the ASBC Asian Confederation Boxing Championships will be opening next week. The Asian hopes won several fights in the first competition day and some of them exceeded the previous expectations with their successes. Thailand’s Wuttichai Masuk returned with powerful performance while the main surprise of the day was done by Mongolia’s Byambatsogt Tuguldur. Mongolia has got strong boxers in their younger generation and among them Battumur Misheelt could be the top prospect. The 21-year-old boxer claimed silver medal in the Indian Open International Boxing Tournament one year ago and arrived to Cologne to represent Team Mongolia. The Mongolian lightweight (60kg) boxer tried to catch China’s Lin Yulong in the first round and ruled the middle of the ring. The Chinese boxer finished the first round with a strong combination but Misheelt turned up the heat in the second. The final verdict was split decision in the favour of the Mongolian youngster who opened his campaign with a tough triumph in Germany. Thailand’s Chiranchaya Phunsang claimed bronze medal at the Taipei 2015 AIBA Women’s Junior World Boxing Championships and the 20-year-old boxer received the right to attend in the Cologne Boxing World Cup. The 20-year-old Thai talent had to meet with Romania’s Claudia Nechita in her debuting contest in Cologne and her attacking style was effective in the first round. 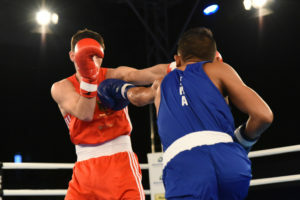 Phunsang’s strong performance was respected from the Romanian boxer who won three international tournaments in 2018. The Thai talent won the contest by unanimous decision surprising her European opponent on Day1. India’s Pinky Jangra Rani was quarter-finalist in the New Delhi 2018 AIBA Women’s World Boxing Championships and she attended in the recent two editions of the Commonwealth Games but she lost to her tough local rival Nikhat Zareen in the Indian National Trials. Rani is not in the position to attend in the upcoming ASBC Asian Confederation Boxing Championships but she started well in the Cologne Boxing World Cup. The experienced Indian flyweight (51kg) boxer was more effective than her German opponent Ursula Gottlob and advanced to the next stage of the event. Mongolia’s Byambatsogt Tuguldur had strong youth and junior successes and joined to the elites in 2018. He is member of their new generation but currently he is No.2 behind Rio 2016 Olympian Chinzorig Baatarsukh in Mongolia at the light welterweight (64kg). The 19-year-old talent had to face with Russia’s Youth Olympic Games winner Ilia Popov and exceeded all of the previous expectations in Cologne. Tuguldur caught his Russian rival in the first round and he was able to continue his job in the same strong level until the end of the final bell. Tuguldur defeated the technician Russian boxer which scalp is his career highlight. Thailand’s Wuttichai Masuk is Incheon 2014 Asian Games winner, ASBC Asian Champion and earned bronze medal at the Doha 2015 AIBA World Boxing Championships but he was not able to repeat those tough results in the recent years. The Thai light welterweight (64kg) boxer controlled the first round against Germany’s Murat Yildirim in Cologne and enjoyed their contest from the second. The German boxer was quarter-finalist at the Hamburg 2017 AIBA World Boxing Championships but Masuk delivered his very best and eliminated the host nation’s pride in Cologne. Thailand’s Nattapong Jankaew is attending in his first ever international event out of his country but he proved his strong fighting spirit against Armenia’s more experienced Vahe Badalyan. His opponent claimed silver medal in the 2015 EUBC European Confederation Youth Boxing Championships in Kolobrzeg. The inexperienced Thai boxer felt the tempo and he was a hard target for the Caucasian who was not enough confident from the second round. Jankaew had a strong game plan and he was able to follow it until the end of the final gong eliminating a top rival in Cologne.